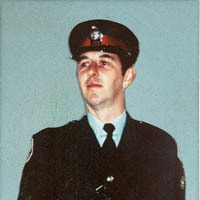 On September 18, 1984, Constable David Alexander Dunmore and his partner were on patrol when they received an all-points broadcast of a stolen vehicle whose occupants had threatened two people with a gun. Constable Dunmore and his partner spotted the vehicle and attempted to pull it over when the driver hit the brakes abruptly. As the officers attempted to exit their police car, the suspect opened fire, hitting Constable Dunmore in the neck and chest. Constable Dunmore died en route to hospital.